ACTIMAR® HYPERTONIC Pure Marine Plasma® is all about Energy, Hydration and Cellular Nutrition. 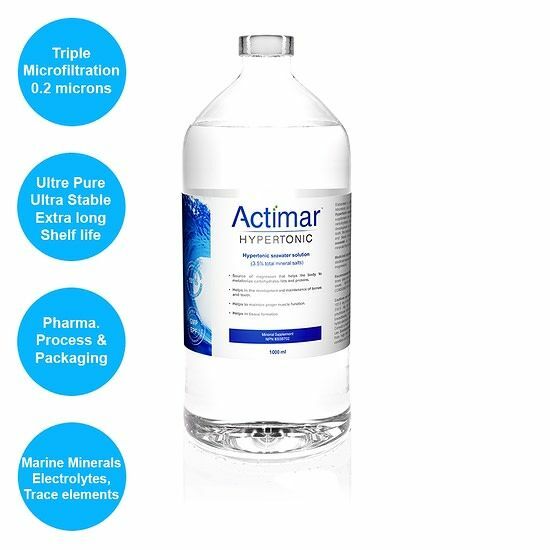 Elaborated in a GMP certified pharmaceutical laboratory, ACTIMAR® HYPERTONIC, Pure Marine Plasma is not only efficacious but also safe for a fast electrolytes, minerals and trace elements intake. ACTIMAR® HYPERTONIC is 3 times as concentrated as the isotonic formula for a fast action and greater mineral intake. It is the formula of choice for a quick boost. Benefit today from all the bioavailable nutrients found in cold micro filtered Actimar®, Pure Marine Plasma®. Helps to maintain proper muscle function.